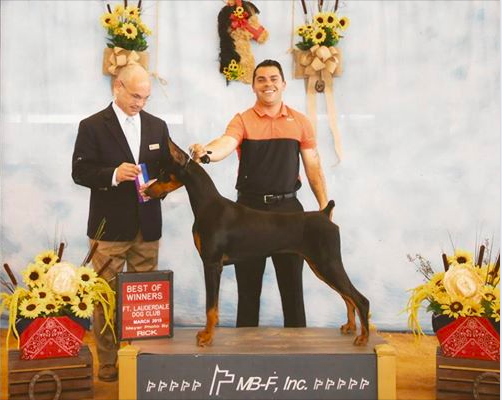 Aludra's Dixie Flyer, "DIXIE" @ 8 mos, going WD/BOW for 2 points under Judge Harry Schulman/Fort Lauderdale Dog Club with his friend/handler Hernan Pacheco piloting. Dixie is sired by Ch Jager's Got My Mojo Working out of Ch Aludra's Sugar Moon. Congrats to Dixie! Dixie will be competing in NC at the end of this month and I will be so happy to have him home again. Dixie's handlers are awesome and his breeder is the best! Sleek and handsome! Nice job. Congratulations!!! Can’t imagine how much you miss him. Is it me or does Hernan look like he's wearing a tube top in the thumbnail lol. Congrats and LOVE the pics! BTW Love the name - Dixie ! Great looking boy - for sure ! Hernan is awesome, isn't he? His wife Allison is too. I hope this is a bigger picture.